Hong Kong is consistently rated among the world’s top three international financial centres and first in Asia. Our information and communications technology (ICT) infrastructure is equally world-class. Hong Kong’s financial regulatory framework enables innovation, while protecting users and the industry in general. And our talent pool is multilingual and multitalented as I’m sure you’ll discover in the course of this FinTech Week. More importantly, Hong Kong welcomes you with an inclusive spirit of entrepreneurship, and with the assurance of a level playing field for all. You may be well aware that Hong Kong is the freest economy in the world. Our government concentrates on promoting and facilitating, so that you can focus yourself on innovating and business building. Earlier this year, I dedicated $500 million to develop the financial services industry, and fintech is definitely on the agenda. I also allocated nearly $200 million to Cyberport as part of our determined effort to support fintech start-ups. The Government’s $2 billion Innovation & Technology Venture Fund and Cyberport’s Macro Fund also help finance new fintech projects. Private funding from angel investors, venture capitalists and private equity funds is also rife. Indeed, investment in Hong Kong-based fintech companies exceeded US$500 million in 2017 – more than doubling the amount in 2016. Hong Kong is undoubtedly an ideal launch pad for those seeking a future in fintech. There are well over 300 fintech start-ups at Cyberport and Hong Kong Science Park and over 150 other fintech companies are flourishing in the private co-working spaces dotted all over Hong Kong. Our Fast Track Programme is here, right outside this hall, to support you to join the league. Specialists from InvestHK, as well as our financial regulators and fintech partners, are there to assist you, to help you launch your fintech future here in Hong Kong. What Hong Kong can offer is smartly summed up by the tagline of our new Hong Kong fintech logo, “Launch, Leap and Lead”. I’ve touched on Hong Kong’s resources for launching your fintech company or start-up. We’ll help you make that leap as our city as a whole excitedly rolls into the era of fintech. Just last month, the Hong Kong Monetary Authority launched the Faster Payment System. That means instant fund transfer round the clock in both Hong Kong dollars and renminbi not only between banks, but also between e-wallets. A common QR code for retail payment has also been established, allowing Hong Kong merchants to accept payment from multiple channels, including e-wallets and individual banking apps. By the end of this year, the first batch of virtual bank licences will be given to those virtual banks to open their portals. An Open API framework is also on the way. It will allow fintech companies to collaborate with banks in providing innovative offerings. As for leading, that means, among other things, expanding our markets. We’re certainly working on that. Those of you who make the trip to Shenzhen this Friday will get a first-hand appreciation for that and for the possibilities, the promise, of the Greater Bay Area and Hong Kong’s role, very unique role, in this national development strategy. The Greater Bay Area links nine prosperous cities in southern China together with Hong Kong and Macau. Together, they count some 70 million ready consumers of financial services, and of course fintech. 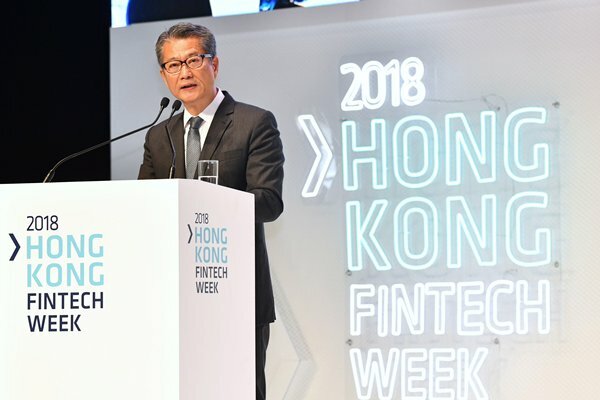 Financial Secretary Paul Chan gave these remarks at the opening of Hong Kong FinTech Week 2018 on October 31. In early 1978, the then Chinese Vice-Premier Gu Mu led a delegation to France and other Western European countries to understand the economic structure and development of Europe. At that time, Beijing’s international airport could manage the landing and takeoff of two planes per hour, whereas at Charles de Gaulle Airport of Paris, 60 flights took off and landed in an hour. Understandably, the Chinese delegation was spellbound. In December of 1978, the Central People’s Government made an important step and pushed through multiple economic reforms, opening up China to the world. History was made thereafter. We began to witness an unprecedented growth in the Chinese economy, and how it swiftly and effectively raised the living standards of its vast population. The world watched in awe as Mainland China created countless economic miracles and gradually increased its influence on global issues. This transformation has changed the way that the world does business. China not only exported consumption goods such as sweaters, water bottles, mobile phones, but also technology and ideas. From 1979 to 2017, China’s average economic growth stood at 9.5%, significantly higher than the 2.9% global average. In 2001, China became a member of the World Trade Organization (WTO), completing the last leg of the country’s journey of integration into the world economy. WTO membership has opened up China’s market for more international trade and investment, as well as opening up the world economy for China’s exports. “Made in China” became a household brand, drastically changing consumer habits in every corner of the world. In the wake of the country’s reform and opening up, Hong Kong’s labour-intensive production processes were relocated north to the Mainland. Hong Kong’s geographic proximity to the Mainland has allowed easy access to the huge market and the vast population in the Mainland. Businessmen from Hong Kong equipped with capital, international trading networks and management expertise started from Shenzhen, and then slowly built up a sophisticated manufacturing network in Dongguan and other cities in Guangdong, shipping all their products to the world. Success stories of Hong Kong enterprises quickly caught the world’s attention, and encouraged many multinational companies to invest in China. Hong Kong does not only contribute to the economy of China, but has also benefitted substantially in many ways. At the dawn of the reform and opening up, as factories were moved to the Mainland, Hong Kong began to transform itself into a service economy, becoming an international finance, trading and maritime centre. When we look back at the past four decades, there is absolutely no doubt that China’s reform and opening up has brought prosperity and stability to the country, as well as important changes to the economic and social landscape of Hong Kong. Hong Kong has grown from an economy focusing on light industries such as textiles and clothing, toys, watches and more to become an international financial, trading and transportation hub. Indeed, the Washington-based Heritage Foundation has rated Hong Kong the world’s freest economy for 24 years in a row. As an externally oriented, open and vibrant economy with a robust legal system and the rule of law; as an international financial, business, professional services, logistics and maritime centre; and as a safe and welcoming metropolis with world-class infrastructure where East blends harmoniously with West, Hong Kong is strategically placed and, indeed, destined to play a crucial role as the super-connector, super-facilitator and super-promoter between China and the world as our country continues to open up to the rest of the world. To contribute towards the country’s comprehensive reform, Hong Kong will strengthen its co-operation with the Mainland. Travelling to the Mainland cities is now much faster than ever. The Hong Kong Section of the Guangzhou-Shenzhen-Hong Kong Express Rail Link came on stream last month (September). The Hong Kong-Zhuhai-Macao Bridge has just commenced service. The Liantang/Heung Yuen Wai border crossing is expected to come into operation in the first half of next year and will further improve connectivity to the eastern part of the Pearl River Delta. Leveraging on our capability in scientific and technological research with four of our universities amongst the world top 100, and our institutional strengths and unique advantages under “one country, two systems”, Hong Kong is well placed to contribute to the national strategy of developing the Guangdong-Hong Kong-Macao Greater Bay Area into an international innovation and technology hub. As we celebrate this important occasion, an occasion for the 40th anniversary, let me reassure our international and local audience today that Hong Kong will continue to contribute to the reform and opening up of the motherland by playing a key and constructive role for the long-term development and prosperity of the country. Chief Secretary Matthew Cheung gave these remarks at the “China’s 40 Years of Reform & Opening Up: Implications for the World & Role of Hong Kong” seminar on October 29. Following our Chief Executive’s attendance at the first meeting of the leading group led by Vice-Premier Han Zheng for the development of the greater bay area (Guangdong-Hong Kong-Macao Greater Bay Area) in Beijing in August, more initiatives have been announced. Last month, the Ministry of Science & Technology and the Innovation & Technology Bureau of the Hong Kong Special Administrative Region (HKSAR) Government signed a co-operation arrangement to promote exchanges and collaboration on science and technology as well as an agreement on jointly funded projects. The two sides will enhance co-operation in six areas, namely scientific research, development of platforms, nurturing of talent, transfer of research and development (R&D) results and incubation of innovation and technology (I&T) industry, integration into national development strategies, and cultivation of an I&T atmosphere. The two documents mark a new page of scientific and technological collaboration between the Mainland and Hong Kong. Meanwhile, the Chinese Academy of Sciences will establish a presence of its research institutions, the Guangzhou Institutes of Biomedicine & Health and the Institute of Automation, in the two research clusters to be set up at the Hong Kong Science Park. This will enhance R&D collaboration with local higher education institutions and research and development centres. I will talk more about these clusters later on. Hong Kong has more than 40 academicians from the Chinese Academy of Sciences and Chinese Academy of Engineering. We will establish a greater bay area academician alliance in Hong Kong to promote the participation of academicians in the development of the greater bay area. With strong national support, the HKSAR Government is committed to fostering I&T development in Hong Kong. We will step up our efforts in eight major areas, namely increasing resources for R&D; pooling together technology talent; providing investment funding; providing technological research infrastructure; reviewing existing legislations and regulations; opening up government data; Government leading changes to procurement arrangements and strengthening popular science education. Further to the $78 billion invested in the past three years, the Policy Address this year announced by our Chief Executive on October 10 has further allocated $28 billion for I&T development. The unprecedented resources invested are the best proof of our commitment to developing I&T. Our Chief Executive has announced a number of new initiatives in her second Policy Address, focusing on expediting re-industrialisation; unleashing the R&D capability of universities and research institutions and fostering technology transfer; bringing I&T into the daily lives of citizens; and building a technology-savvy Government. For example, we will launch a $2 billion Re-industrialisation Funding Scheme to subsidise manufacturers, on a matching basis, to set up smart production lines in Hong Kong. To unleash our strengths in scientific research, we will double the funding ceiling for Technology Transfer Offices of dedicated universities, the Technology Start-up Support Scheme for Universities, State Key Laboratories and Hong Kong branches of the Chinese National Engineering Research Centre, providing more resources for R&D and its commercialisation. Among our key initiatives is the establishment of two world-class research clusters, as I mentioned earlier, at the Hong Kong Science Park, namely “Health@Inno HK” that focuses on healthcare technologies, and “AIR@Inno HK” that focuses on artificial intelligence (AI) and robotics technologies. We will invest $10 billion to establish the two clusters, which will foster more synergy and collaboration between top local and overseas researchers and put Hong Kong on the global innovation map. Our targets are top-notch universities, research institutions and technology enterprises from all over the world. We will provide financial support for research centres and laboratories set up by non-profit making institutions at the two clusters. It is encouraging that in recent months, a number of world-renowned universities and research institutions have already approached us, expressing a keen interest in setting up research operations in Hong Kong. We welcome more research institutions and technology enterprises from the Belt & Road economies or AI/robotics technologies to come to Hong Kong and join the two research clusters. This will enable them to tap the enormous growth potential of I&T markets in the greater bay area. Such collaboration will surely be a win-win for all parties. Meanwhile, we are working full steam ahead to develop the Lok Ma Chau Loop into the Hong Kong-Shenzhen Innovation & Technology Park. With a site area of 87 hectares – four times that of the Hong Kong Science Park in Tai Po, the Hong Kong-Shenzhen Innovation & Technology Park will be Hong Kong’s largest I&T platform ever, creating unprecedented opportunities for I&T development and collaboration. The park will be developed as a key base for scientific research, where relevant higher education, cultural and creative, as well as other complementary facilities will be provided. It will attract top-tier research institutions, technology enterprises and higher education institutes from Hong Kong, the Mainland and overseas. We have set aside $20 billion for the first phase development of the Park. In addition to infrastructure, talent is also an essential piece in the jigsaw of I&T development. We launched the Technology Talent Admission Scheme in June to enable technology companies and institutes to admit on fast track overseas technology talent in focused technology areas, such as biotechnology, artificial intelligence, cybersecurity and robotics. We also launched the $500 million Technology Talent Scheme in August. The Postdoctoral Hub programme provides funding support for enterprises to recruit postdoctoral talent for scientific research and product development. The scheme will also fund local companies on a 2 to 1 matching basis to train their staff in high-end technologies, especially those related to Industry 4.0, through its Re-industrialisation & Technology Training Programme. To encourage private investment in R&D, we have also introduced enhanced tax deduction for R&D investment. The first $2 million eligible R&D expenditure will enjoy a 300% tax deduction, with the remainder at 200%. Ladies and gentlemen, with I&T development high on the national agenda, and enjoying the dual advantage of “one country, two systems”, Hong Kong will continue to seize the invaluable opportunities brought about by the greater bay area initiative in unleashing our I&T potential and developing Hong Kong into an international I&T hub. 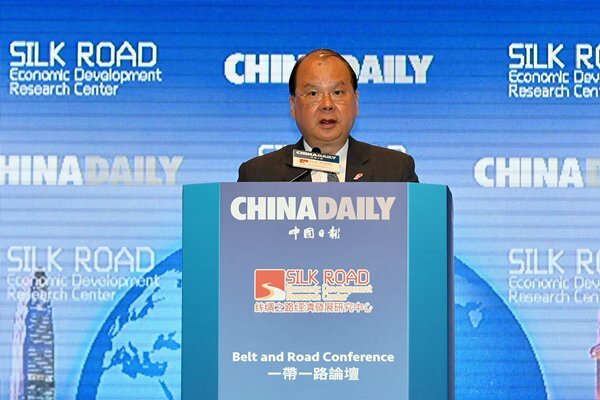 Chief Secretary Matthew Cheung gave these remarks at the Belt & Road Conference co-organised by China Daily and the Silk Road Economic Development Research Center on October 29. This year marks the 40th anniversary of China’s reform and opening up, which has profoundly changed the country and the lives of its people and helped change the world. It has been well acknowledged that over this 40 years’ journey, Hong Kong has played a significant and unique role; we are a contributor as well as a beneficiary in China’s reform and opening up. As a contributor, we shared our experience with the Mainland and contributed to the rapid modernisation of the country in different aspects. A large number of Hong Kong businessmen and entrepreneurs were the first to invest in the Mainland, setting up production lines in the Pearl River Delta region and bringing with them capital, talent and management systems. We are proud of our contribution, and are even more proud to witness the achievements of our country in the past 40 years. China is now the world’s second largest economy, largest industrial manufacturer, largest goods trader and largest foreign exchange reserve holder. In the past 40 years, our country’s total import and export value surged by 178 times and its gross domestic product per capita rose from merely about US$200 in 1978 to over US$8,000 today, improving our people’s livelihood significantly. Our country has become an economic powerhouse, and has also become a key stabiliser and driving engine for global economic growth. Having served as our country’s window to the world in the past 40 years, Hong Kong is a beneficiary of the country’s reform and opening up. The city has successfully transformed herself into an important bridge linking the Mainland and the global market. We have established and reinforced our present position as an international commercial, logistics, shipping, financial and professional service centre. There is so much to recount and so many people to recognise that the HKSAR Government has decided to host a major exhibition later in the year to commemorate the 40th anniversary. As an ancient Chinese saying goes, “we should focus our mind on the future, not the past”. I would therefore like to use the next few minutes to discuss how I see the role of Hong Kong as our country enters into a new era. In addressing the APEC CEO Summit held in Da Nang last November, President Xi Jinping spoke on how we should seize the opportunity of a global economy in transition and accelerate development of the Asia-Pacific. He said that faced with the profound changes in the global economy, we must advance with the trend of times and live up to our responsibility and work together to deliver a bright future of development and prosperity for the Asia-Pacific. Specifically, he outlined the strategies that nations should continue to foster an open economy, pursue innovation-driven development and create new drivers of growth, enhance connectivity and achieve interconnected development and make economic development more inclusive and deliver its benefits to our people. I can see the relevance of Hong Kong, and an important role to play, in each of these four strategies, especially leveraging on our unique advantages under “one country, two systems”. We will continue to use our strength to serve the country’s needs, with a goal to attain growth jointly with the country and sharing prosperity with all people. First, as a founding member of the World Trade Organization, Hong Kong is a staunch supporter of free trade and the rule-based multilateral system. We will continue to provide the testing ground for the further opening up of the Mainland economy whether in terms of trade and investment or financial services. Our latest annual survey showed that over 8,700 Mainland and overseas companies had established regional headquarters, regional offices or local offices here. Hong Kong is a favourite platform for overseas companies to access the Mainland market and for Mainland companies to go global. Our highly competent and reliable professional services are credible partners of both Mainland and overseas companies in their various endeavours. My Government will be happy to perform the roles of a “facilitator” and “promoter” in helping our companies, particularly SMEs, to seize the many opportunities available to us. Secondly, we are pressing ahead with nurturing new drivers of growth and innovation-driven development. These include a substantive eight-pronged strategy to develop innovation and technology in Hong Kong and the promulgation of a Smart City Blueprint. In my Policy Address announced earlier this month, I have earmarked HK$28 billion to support university research, encourage re-industrialisation and promote technological entrepreneurship, and this is on top of HK$50 billion earmarked by the Financial Secretary in his Budget earlier this year. Even for traditional sectors like financial and shipping, we are driving growth through innovation with the adoption of new listing rules to facilitate the raising of capital by new economy as well as bio-tech companies and a series of initiatives to grow the value-added maritime services to complement our port business. Thirdly, on connectivity and interconnected development, one key area that Hong Kong seeks to contribute to the country’s development will be in the context of the Belt & Road Initiative. Announced by President Xi five years ago, the Belt & Road Initiative is built on multilateral co-operation in infrastructure, in trade and investment, in culture and in people-to-people bonds. The Belt & Road Initiative will rise as a global economic force deep into the 21st century, bringing benefits to countries along the Belt & Road as well as other countries that embrace the initiative. Hong Kong is prepared to offer our expertise in professional services for countries and enterprises seeking to participate in the initiative. We are home to a large professional services cluster with extensive global networks and affiliations, and our expertise covers infrastructure development, financial services, engineering, consultancy, accounting, law, etc. These services will be in considerable demand for infrastructure and other projects arising from the Belt & Road Initiative. Capital formation is among the key services that we can offer. With liquid capital flow and a deep pool of global financial talent, Hong Kong is the natural centre from which to raise funds for infrastructure, investment and production projects. We are also ideally suited to provide the risk management, insurance and dispute-resolution services that Belt & Road partners and their projects may need. As the world is increasingly aware of the importance of sustainable development, we can expect that many of the projects will be green projects. As a matter of fact, the strong demand for green funding and for green investment opportunities have led to the exponential growth in global green finance, including in the issuance of green bonds. Hong Kong is ready to play our part in green financing, thereby making a contribution to the sustainable development of the world. Subject to the authorisation of the legislature, my Government will launch a green bond issuance programme with a borrowing ceiling of HK$100 billion, making it among the largest sovereign green bond issuance programmes in the world. We have also launched the Green Bond Grant Scheme, which subsidises the costs issuers incur in obtaining certification under our Green Finance Certification Scheme. In short, we hope to make Hong Kong a fund-raising hub for green projects, and encourage more Belt & Road investors and issuers to participate in the Hong Kong bond market. Closer at home to achieve interconnected development is the Guangdong-Hong Kong-Macao Greater Bay Area. Thanks to the opening of the Guangzhou-Shenzhen-Hong Kong high speed rail and the Hong Kong-Zhuhai-Macao Bridge over the past month or so, there is now a one-hour living zone which will provide excellent opportunities for Hong Kong businesses and service providers to collaborate with their Mainland counterparts to pursue new drivers of growth such as in jointly developing an international innovation and technology hub. Finally, inclusiveness is highly relevant to today’s world. In May this year, I participated in the opening of the Ministerial Segment of the 74th Session of United Nations Economic & Social Commission for Asia and the Pacific (ESCAP) in Bangkok, Thailand. The meeting recognised that, while the Asia-Pacific region has experienced a tremendous socio-economic transformation since the early 1990s facilitated by strong and sustained economic growth, unfortunately the gains from this remarkable performance have not always benefitted those most in need. As a result, many countries in the region have experienced a widening of existing inequalities, accompanied by environmental degradation. To make economic development more inclusive, we need to improve systems and institutions to uphold safety, equity, efficiency and justice. In this regard, Hong Kong is more than willing to share our experience and help build capacity in emerging economies, as part of Hong Kong’s contribution to the promotion of people-to-people bonds in the global environment. Hong Kong has huge experience in urban planning and city management, from new town planning to revitalisation of historic sites and buildings, from flood prevention and slope stabilisation to country park conservation, from daily traffic management to railway operation and aviation safety, from social services to emergency services such as firefighting, etc. We have also built institutions to fight against corruption, promote equal opportunities and deal with administrative complaints. We will be most pleased to share our experience with emerging economies. In fact, our Independent Commission Against Corruption has been sharing its rich experience in fighting corruption in Hong Kong with regions and countries along the Belt & Road to enhance their integrity. The Fire & Ambulance Services Academy in Hong Kong has offered training to firemen from Vietnam and will open its door to other countries. The Hong Kong Airport Authority and the MTR Corporation have respectively set up an aviation academy and a rail academy to nurture local and regional talents. Ladies and gentlemen, 40 years ago, the Central People’s Government of our country sowed the seeds of reform and opening up. Today, we are leveraging on the Mainland, engaging ourselves globally, reaping the fruits of reform and opening up and celebrating our shared success and joint prosperity. As our country continues to develop, Hong Kong is eager to play an even bigger role than before and make a contribution to the country and the world. We will continue to reach out and connect with people of different countries and strengthen the bond between our economies. By understanding the differences in and similarities of our cultures, we will buttress the foundation of our alliance and create a sustainable global environment together. We hope to work closely with all interested economies on all fronts. 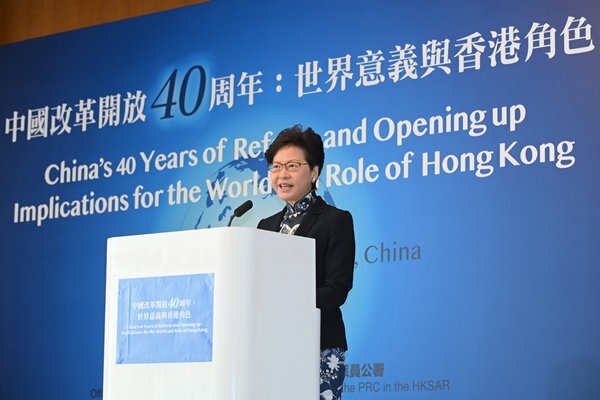 Chief Executive Carrie Lam gave these remarks at the “China’s 40 Years of Reform & Opening Up: Implications for the World & Role of Hong Kong” seminar on October 29. Hong Kong is an open international community. We are open to ideas from different places. With the ageing population, as I said in Chinese earlier, we face a huge challenge here in Hong Kong, particularly the growing ageing community and increasing demand for elderly care and services. Elderly services are the top priority for the Hong Kong Special Administrative Region Government. For every $100 we spend every day, $20 goes to elderly in terms of cash assistance, medical care, home care and elderly care. That underlines the importance we attach to it. We will continue to invest heavily in elderly services because we have to pay back to the elderly population as they contributed to Hong Kong during their young days. Without the elderly, Hong Kong would not be a vibrant community today. So, we have to be grateful and make sure that they will have happy golden years for the remaining part of their life. But in the process, we need joint effort from everybody, not just from the Government alone. We have to build a coalition among academia, Government, NGOs, and also of course, stakeholders to ensure that elderly services are really up to speed and meet the aspirations and expectations of the whole community. 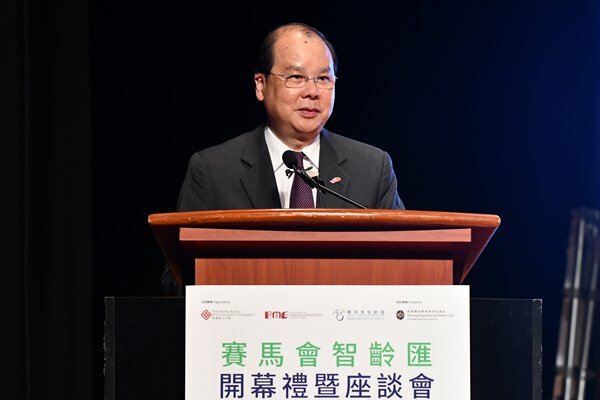 Chief Secretary Matthew Cheung speaks at the Jockey Club Smart Ageing Hub Opening Ceremony & Symposium on October 27. I took part in the groundbreaking ceremony for the Culinary Institute in 2014 as the Chief Secretary for Administration. After four and a half years, I must say it’s gratifying to be here for the formal opening of this purpose-built teaching and training institute in my new capacity as the Chief Executive. It’s gratifying because the results of the planning and remarkable commitment that has gone into bringing this state-of-the-art institute to creative life are simply remarkable. The beneficiaries are, of course, the Hong Kong students and in-service practitioners eager to become professional chefs. No less important, the beneficiaries are the people of Hong Kong, and all who visit us from around the world to enjoy our great city, the culinary capital of Asia. More than 15,000 restaurants call Hong Kong home, and food and beverage services engage more than 240,000 people in Hong Kong. That speaks resoundingly of the value of our food and beverage industry, and the importance of ensuring a continuing flow of talent to serve Hong Kong. The Culinary Institute will go a long way toward satisfying that need. Designed to support some 2,000 students, it boasts training kitchens as well as a training cafe, a wine forum, a hall of gastronomy for event training, a sensory lab for food science education and much more. Equally important, the institute employs highly qualified teachers with solid industry experience. It also has celebrated international chefs as honorary advisors and an invaluable network of professionals and institutions from Hong Kong and from all over the world. In short, it has what Hong Kong needs to produce talented professionals capable of creating European, Mediterranean, American, Middle Eastern and Asian cuisine. Alongside our Chinese Culinary Institute and the Hospitality & Tourism Institute nearby, there will be a creative confluence of hospitality and culinary education, interaction and collaboration. I am sure that it will become one of the region’s leading international culinary institutes. The institute’s opening underlines my Government’s support for vocational and professional education and training, VPET. Such training offers more than technical and practical knowledge. It also provides whole-person development, soft-skills training and international experience. It aims to equip our students to meet the rising expectations of the industries and of the community. The Vocational Training Council has from its very beginning in 1982, served as a valued partner of the Government, building a quality workforce to support Hong Kong’s sustainable development. Indeed, the culinary institute is one of 13 VTC member institutions. Together, they provide education and training from post-Secondary 3 to degree levels for some 250,000 students a year, enhancing professional knowledge and skills to meet our employment needs in this 21st century of opportunity. That said, attracting students into vocational and professional training remains a challenge. The value of such training, and the bright prospects it offers our young people with the interest and suitable attributes, is still not fully appreciated by some in our community. With that in mind, my Government established the Task Force on Promotion of VPET earlier this year. Chaired by Roy, the task force will advise on strategies for building closer collaboration between business and our vocational and professional education and training. The goal is to promote the value of VPET for our youth in the context of a multiple pathway regime. Given your leadership, Roy, I’m sure the task force will deliver recommendations that make a decided difference for all concerned. My Government will continue to work with the Vocational Training Council in providing the latest learning facilities for its students. Our recent support of the multi-disciplinary campus in Cha Kwo Ling and the Aircraft & Marine Engineering Centre at the IVE Tsing Yi campus reflect that commitment. So does this dynamic new campus. With its inspired salt crystal design, it stands as an essential element and a much welcomed addition to Hong Kong’s splendid vocational offerings. 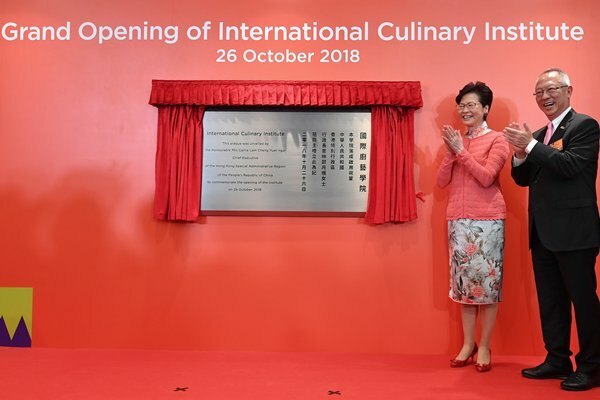 Chief Executive Carrie Lam gave these remarks at the grand opening of the International Culinary Institute in Pokfulam on October 26. I think the Wine & Dine Festival found its way to excellence a good while back. And year after year, it just keeps getting better. This 10th anniversary festival, ladies and gentlemen, is the most ambitious to date. Certainly the largest, expanding past the Central waterfront. More than 30 countries and regions are participating, a big jump over last year’s 21 countries and regions. Booth totals are also expanding – to 450, up from 400 last year. They include, I should add, nearly 320 wine booths in six thematic zones. In celebration of the festival’s anniversary, Wine & Dine 10th Edition specials are on offer, together with a series called 2009 Vintage, which includes selections from Robert Parker’s 100-Point red wines. That sounds almost perfect. Speaking of which, you’ll want to pick up the Perfect 10 Passport, a winning combination of wine and food pairings to share with family and friends, new and old. Speaking of food, two new zones have been introduced – International Street Eats and Coffee Fiesta, the latter filled with lots of sweet treats. I’d say we deserve them. With the help of this annual autumn celebration, Hong Kong has emerged as Asia’s wine hub and a global centre for wine trading and auctions. In the first half of this year, we imported more than $6 billion-worth of wine from all over the world. That, ladies and gentlemen, reflects year-on-year growth of 9%. Our top three wine importers in 2017 were France, Australia and the UK. In June we signed an MoU with Bordeaux, our long-time partners in wine-and-food tourism promotion. Another MoU – this one expanding co-operation in wine-related education and manpower training between Bordeaux and Hong Kong – is in the pipeline, or perhaps it should be a “wine line”. The agreements will boost our role as the ambassador for the best wines from Bordeaux and other resplendent wine-making regions. Financial Secretary Paul Chan gave these remarks at the 2018 Hong Kong Wine & Dine Festival opening ceremony on October 25. Getting the right infrastructure in the right place at the right time, as you can see from here in Hong Kong, is surely key to economic growth and prosperity. The challenge, of course, is getting the funding to make it work, or more precisely, getting private funding to play a bigger role in infrastructure development. Making infrastructure bankable is one of our great challenges. We need answers as quickly as they can be raised. Between 2016 and 2030, developing Asian countries will require infrastructure investment totalling US$26 trillion, in other words, US$1.7 trillion a year on average, to maintain growth, fight poverty and address climate change. Infrastructure spending, to date, has largely come from the public sector, namely governments and multilateral development agencies. As the funding gap continues to expand, public-sector investment will no longer be adequate. At the same time, we are seeing strong infrastructure investment interest among private investors. However, there is a lack of bankable projects out there for investors and financiers due to a number of issues from political and legal risks at the country level, to construction, operation and financial risks at the project level. In short, mitigating these risks is critical to improving the bankability of infrastructure projects and, in doing so, narrowing the infrastructure financing gap. At the recent Finance Minister’s Meeting of the Asia-Pacific Economic Cooperation (APEC) which I attended last week in Papua New Guinea, infrastructure financing was one of the focus areas. The APEC Business Advisory Council, which comprises representatives from the private sector of each APEC economy, also urged financial ministers to explore ways to make infrastructure projects more bankable. In this regard, the Asian Infrastructure Investment Bank (AIIB) plays a key role, bringing countries together to address Asia’s urgent infrastructure needs and improving social and economic development in the region. In operation only since 2016, the bank has already approved projects worth more than US$5 billion. Hong Kong has been a member of the AIIB since June of last year. We have the resources, capital, connections and expertise, to contribute to the AIIB. Indeed, we have what it takes to serve as the region’s fundraising and financial management hub for infrastructure projects. The Stock Exchange of Hong Kong has led the world in IPO (initial public offering) fundraising in five of the past nine years. Last year, our IPO funds totalled US$16.5 billion. And it is highly likely that this year we will top the world again given the huge amount of funds raised so far this year. As mentioned last year, our Securities & Futures Commission also set out the criteria for assessing the eligibility of infrastructure project companies looking to list on our Main Board. It provides a clear pathway for infrastructure project companies. This year, in order to promote sustainable developments in the region, we have launched a Green Bond Grant Scheme to subsidise the costs incurred by green bond issuers in obtaining green finance certification. We are also working on a Government Green Bond Programme, with a borrowing ceiling up to HK$100 billion, to fund Government green public works projects. In addition, we have introduced a pilot Bond Grant Scheme plus tax incentives to attract more issuers to Hong Kong. In the first half of this year, at least 15 green bonds were issued in Hong Kong, with an aggregate size of US$8 billion. The Asian Development Bank, the World Bank and the European Investment Bank were among the issuers. This speaks well of Hong Kong’s promise as a regional green finance hub. The first and foremost important step in ensuring a project’s bankability, perhaps is a proper project feasibility study and preparation. In this regard, I applaud AIIB for the introduction of a Project Preparation Special Fund to assist lower income developing countries with funding support for appropriate technical assistance, in their preparation of projects for subsequent consideration and approval by AIIB. Hong Kong has therefore pledged to donate US$10 million to this worthy cause. On risk mitigation, our deep pool of multicultural finance and legal professionals is our compelling advantage. Leading the field in conducting project feasibility, due diligence, financial engineering and arranging for insurance, we are able to help de-risk infrastructure projects to make it more bankable. Our legal profession can also help ensure contract enforcement and resolve disputes. We are well-positioned to serve as the region’s international arbitration hub for commercial disputes. 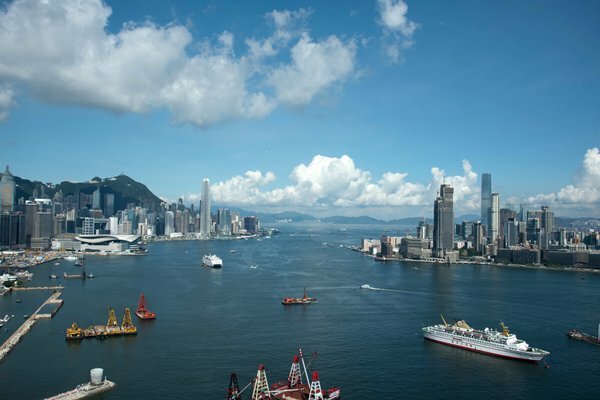 Arbitral awards made in Hong Kong are enforceable in over 150 jurisdictions, including the Mainland of China. As China’s international financial capital, Hong Kong is also the world’s largest offshore renminbi (RMB) business hub. That makes us an attractive destination for those who wish to raise funds in RMB, in addition to US dollar. The Infrastructure Financing Facilitation Office of the Hong Kong Monetary Authority (HKMA) is a first mover in infrastructure financing. Its network of partners has now exceeded 90. Coming from all over the world, they include development banks, project developers and operators, financiers, institutional investors and professional services firms. Apart from financing green field projects, we are also looking at how we may better assist projects in the brownfield stage. The new capital standards for banks do not make it attractive for them to hold on to these infrastructure loans on a long term basis, even though the projects are operating smoothly and profitably. Yet, there are many other investors, such as insurance companies and pension funds, which are looking for less risky investments that can produce stable long-term cash flow. The Hong Kong Mortgage Corporation Limited, again under the HKMA is pursuing the proposition of securitising infrastructure loans to provide banks with opportunity to offload their loans to those long-term investors. That will facilitate additional flow of capital into infrastructure projects. Hong Kong, in short, is fast becoming a key infrastructural financing centre. We have the means, the expertise and the motivation, to serve as a hub for the AIIB, sourcing investment opportunities, prospective investors, and financing partners. Hong Kong, of course, is a world leader when it comes to infrastructure, finishing second in the category in this year’s Global Competitiveness Report by the World Economic Forum. Our annual infrastructure investment has soared from US$2.5 billion to more than US$10 billion over the past decade. In the coming five years, we expect that the annual contract value of construction work in Hong Kong to reach US$30 billion or so, given our unshakable commitment in increasing land and housing supply, expediting hospital developments, building railway extensions and other infrastructure projects. Infrastructure has long been the engine driving Hong Kong’s economic growth. The Chief Executive announced in her Policy Address, delivered about two weeks ago, the Lantau Tomorrow Vision. Under this vision, we will begin studies on a large-scale reclamation in phases. The first phase will encompass some 1,000 hectares of artificial islands southeast of Lantau and to be followed by a second phase comprising 700 hectares of artificial islands. Together, they will provide land to sustain the long-term housing, economic and employment needs of Hong Kong. The reclaimed land will also allow us to thin out our densely populated urban areas. It will enable the redevelopment of old districts and improve our overall living environment, while achieving more balanced spatial development for Hong Kong. The artificial islands will become Hong Kong’s third core business district after Central and Kowloon East, and we will ensure that plenty of space is set aside for business and industrial development. Roads and railway networks will be built to support the new developments and to relieve traffic in the western part of the New Territories. We also see a promising opportunity to create a cluster of airport-related businesses in the proximity of the Hong Kong International Airport. And, let me make it clear, we are as committed to protecting the natural and rural environment of Lantau as we are to pursuing this far-reaching vision. And we have set aside a dedicated fund for that purpose. Ladies and gentlemen, this is a development without precedent, huge in scope and vast in its significance. Such an undertaking will bring with it diverse views throughout the community. That’s both understandable and welcome. Constructive comments can help ensure its ultimate success. Rest assured, we believe in the Lantau Tomorrow Vision, in its long-term promise – that of ensuring a sustainable, thriving and liveable city for the people, and for the economy of Hong Kong. 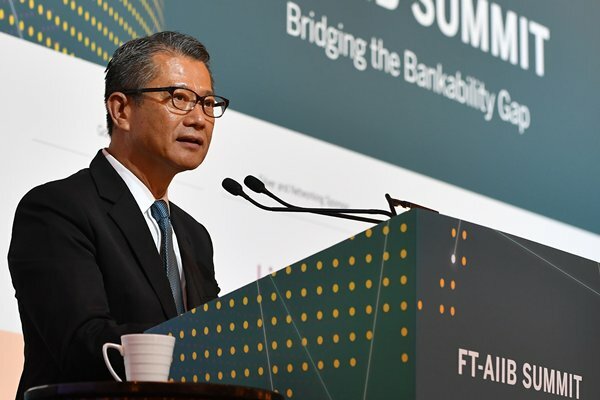 Acting Chief Executive Paul Chan gave these remarks at the Financial Times-AIIB Summit on October 23. During World War II and in the years following the war, Hong Kong was plagued by TB (tuberculosis) which is not surprising, given the overcrowding living environment, the unstable social conditions, and poor nutrition. And then in 1948, the Hong Kong Tuberculosis, Chest & Heart Diseases Association came along with a mission to fight TB, as well as heart disease. A year later, you built Ruttonjee Sanatorium for patients suffering from TB. Thankfully, the number of TB cases plummeted in the 1950s, thanks to the launch of the BCG vaccination for new-born babies, the establishment of a chest service in the Department of Health, increasingly effective treatment and improving socio-economic situation. From a historic high of more than 697 reported cases per 100,000 people in 1952, the TB incidence rate fell to just over 58 cases per 100,000 people last year. That’s thanks to dedicated efforts throughout the community. And, of course, to the association’s outstanding leadership, including its administration of Ruttonjee Hospital and Grantham Hospital, its support for World TB Day and research activities, and its strong links to the World Health Organization and the International Union Against Tuberculosis & Lung Disease. Worldwide, TB is still a significant disease. Indeed, more than 10 million new cases of TB are reported each year. That includes over 4,000 new cases annually in Hong Kong. That said, I am confident that the association’s vigilance and proactive measures will continue to minimise the disease in our community. Indeed, as TB’s threat to the people of Hong Kong waned over the years, the association broadened its reach, and benevolence, into other medical areas of concern. They include elderly home and oral health services, traditional Chinese medicine and health promotion covering the risks associated with smoking and alcohol abuse, physical inactivity and poor diet – all of which are related to cardiovascular diseases, killers of nearly 18 million people every year around the world. Less than two weeks ago, the Chief Executive emphasised in her Policy Address the importance of our healthcare services. I was also pleased to note that life expectancy here in Hong Kong, for men and for women, tops the world. Our health care services are among the world’s most efficient according to the Bloomberg Health-Care Efficiency Index, a global study published just last month which ranked Hong Kong first among 56 economies. That, of course, does not mean any slackening of our commitment to quality healthcare, and certainly no cutting back on the significant resources, expertise and planning we bring to healthcare to the people of Hong Kong. This is why Chinese medicine services would be incorporated into our healthcare system. As announced in my Budget this year, a dedicated fund of $500 million has been created to promote the development of Chinese medicine in Hong Kong. The fund, ladies and gentlemen, will begin operation in the first half of next year. I should also mention another initiation in my Budget underscoring the commitment of the administration on quality healthcare – that is the $300 billion earmarked as an initial provision to support the second 10-year hospital development plan, improve the Department of Health’s clinic facilities, and upgrade and increase healthcare teaching facilities. Your association, I’m pleased to say, has been active in Chinese medicine for a dozen years now. As your chairman noted, the association runs two of the Hospital Authority’s 18 Chinese Medical Clinics. Beyond general medical services, the clinics offer teaching and research services for Chinese medicine practitioners. Your association also promotes Chinese medicine to the general public and is engaged in community-based studies related to Chinese medicine. In short, whether it’s TB or heart disease, working with the elderly or promoting Chinese medicine, the association jumps right in, bringing to the challenge a much welcomed mix of commitment, expertise and decades of experience working on behalf of the people of Hong Kong. I have no doubt that you will continue to collaborate with the Government in these and, no doubt, other areas down the road. 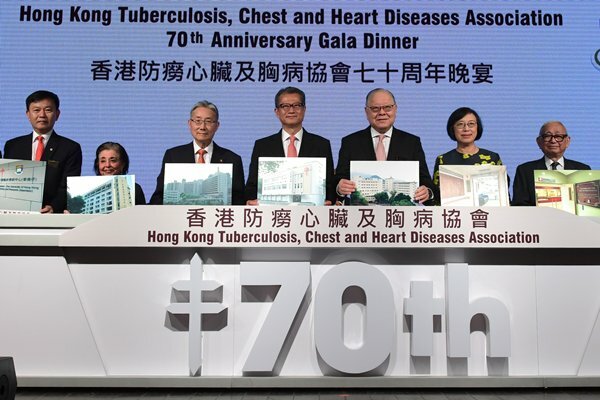 Acting Chief Executive Paul Chan gave these remarks at the Hong Kong Tuberculosis, Chest & Heart Diseases Association 70th Anniversary Gala Dinner on October 22. I would like to make a few points. First of all, Hong Kong has always been a multicultural society where its international, cosmopolitan community is open, vibrant, colourful and diverse. But we really need to do more to promote multiculturalism in Hong Kong. Particularly, if you look at the demographics of Hong Kong at the moment, there are 265,000 non-ethnic Chinese living, working and studying in Hong Kong, just over a quarter of a million. And among them, 86,000 of them are South Asians. A lot of them were born in Hong Kong, making Hong Kong their home. We need to make sure that they integrate well into the community. I also stress, time and again, that they are part of Hong Kong. They are no different from any of us. Hong Kong is their home, a homely home. That is why we have to make sure that they are fully integrated into the community, becoming part and parcel of the whole Hong Kong community. On that basis, because of that conviction, I have decided, during the current term of Government, and have secured the support from the Chief Executive and the Financial Secretary, to have resources to achieve my dream. My dream is that I will co-ordinate Government’s efforts across the whole government spectrum, including the NGOs (non-governmental organisations) if possible dealing with EM (ethnic minorities) in Hong Kong. I want them to work in concert to promote the true integration of EMs into the community and also to promote their upward mobility, particularly the young people – they are very important, making sure that they love Hong Kong, they feel a part of Hong Kong and contribute to the long-term development of Hong Kong. It is my objective. I am very lucky. I managed to get what I want. In fact, the Financial Secretary promised and allocated a one-off funding of $500 million to kick off the whole programme. So off my own bat I set up the Steering Committee on Ethnic Minorities Affairs in the Government in order to co-ordinate holistically the Government’s services across the board. At the same time, I made a point to have dialogue and interact with all the EM concern groups, from Shalini’s to all the religious groups like Sikh and others, particularly the NGOs involved in providing EM services, education, employment, social services, and family support. You name it. I have seen everybody in the last few months. At the end, I managed to cook-up a menu. The menu has been in the public arena. You may have seen it. This is my little pamphlet called “Strengthening Support for Ethnic Minorities” (加強支援小數族裔) is a very long list I tell you. You know in the end, this costs the Government $600 million-plus. I have exceeded the budget. But I’m sure there should be no problem at all because I manage to get the money. Now what we are going to do in a nutshell, I don’t want to keep you because you can actually see it on the website and it is also available publicly elsewhere. But I want to make sure to send you all a copy afterwards. Put it rather simply, we enhance the services across the board from education (to other areas). A good example is kindergarten. If any mainstream kindergarten from now on takes on a few EM kids, previously it’s only eight kids you can get one additional teacher but eight and above, no matter how many, only one additional teacher but it’s not enough. Hence, this enhanced measure: if you get one EM kid, you’ll get eight, then if you get up to 20, say 16, you’ll get 1.5. And then if you get 31, you’ll have two teachers. Under such a threshold, you have 0.5 teachers and also additional funding. So it’s calculated on a pro rata basis, it’s a five-tiered structure. At the same time, some kids with special education needs (SEN) kids, we also provide extra support to kindergartens and schools, across the board. Universities are encouraged and are given a funding to help schools and kindergartens with EM students as well. All these will be happening in the next school year. Employment (is) also breaking new ground. The Labour Department will take on extra staff and also work closely with NGOs and the frontline to provide a case management approach for employment services. You don’t just find a job for these youngsters or find a job for the EM adult, but making sure their upward mobility, upscaling in the process so that they don’t change job every two or few weeks, hop from one job to another, there is no point. We help them find their feet in the labour market and work their way up through support, and we provide training and upscaling which we have never done before. We have also decided that rather than having a social services centre (in all districts) across the whole territory, we target to the areas with large concentration of EM residents, like Yuen Long, Shap Pat Heung, Shek Kong, Yau Tsim Mong, Kowloon City and Tung Chung as well. The approach is that we mobilise the NGOs working through Social Welfare Department, have outreaching services directly hitting the target. They don’t have to come forward, you approach them and reach out to them. For first reason, because of cultural barriers and language barriers, very few are willing to come forward looking for services, we approach them instead. For example, under the Working Family Allowance Scheme, a typical Pakistani family, they have a big family with five or six kids. They are entitled, if the father is working full-time, to $5,000-$6,000 a month from government allowance. It is not social welfare, it’s not the Comprehensive Social Security Assistance, it’s work incentive payment to reward their hard work, self-reliance. They never apply because they don’t know how to apply. They are shy of applying because they don’t know how to approach the Government. We approach them, get them sign the form, fill in the form, they get $5,000-$6,000 a month and also tackle the problem of cross-generation poverty. This is what we are doing, really cracking difficult problems rather than skirting around the corner, really go straight to the problem, the crux of the issue. 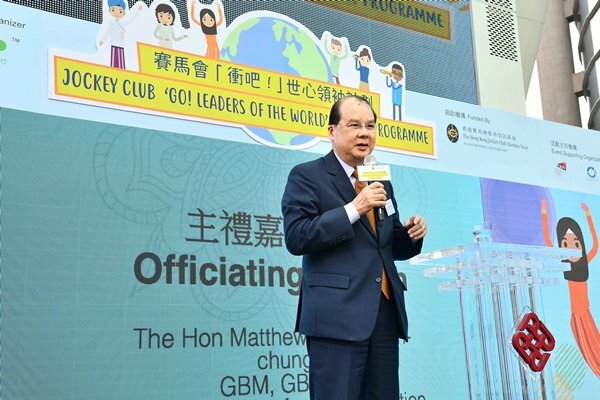 Chief Secretary Matthew Cheung gave these remarks at the Jockey Club “Go! Leaders of the World” Programme Graduation Ceremony on October 20.